Fun game indoors or out! Teams of two compete for the most points. 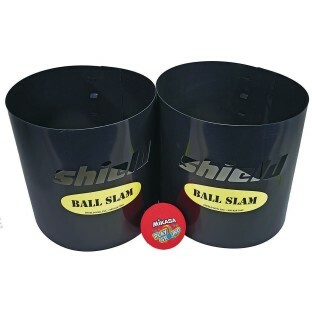 Helps develop throwing skills, ball control, and eye-hand coordination. Plays similar to Saucer Slam or Kan Jam but a little easier since players are tossing a ball instead of a flying disc. Set includes a 5” Mikasa® playground ball, two scoring containers and an Activity Guide with 8 Ball Blam® games. Great for all ages, indoors or out.